‘Learning Paths School’ provides a safe and child friendly transport system for students. 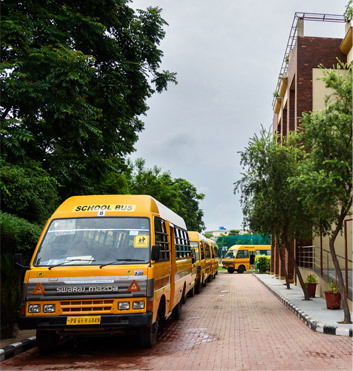 The school has a fleet of Non AC buses catering to students from Chandigarh, Mohali, Kharar, Kurali, Landran, and Zirakpur. The bus drivers are quite experienced and and also go regular medical check up and training. The School administrative staff conducts training classes and regular medical check up for the bus maids, drivers and conductors with special emphasis on safety and security. The window of the bus have been fitted with horizontal grills. The School Name and Telephone No. are written on every bus. Adequate space has been given to keep school bags safely. Every bus has a lady attendant from the school and a conductor. Every bus has a GPS system and CCTV cameras. Parents can track the location of the bus through a mobile app. Text messages are sent to parents of all children on a particular route if a bus is delayed for some unavoidable reasons, although strict efforts are made to maintain punctuality. It is ensured that adequate supervision is provided for bus arrivals and departures.